I had no idea back in 1983 how a devastating car accident would impact the rest of my life, nor how God would continue to show His goodness in a variety of miraculous ways through it– physically, emotionally, and spiritually. My ministry partner Tracie and I co-founded Drawing Water and began performing together in 2002. (By this point in my life I had begun my walk with Jesus and I was immersed in Bible study– but these are stories for another time :-)) Then in 2003, I started experiencing some trouble… I had been advised from the time of my knee rehab. to always wear my brace for physical activity that would involve joint stress– jumping, running, dancing– and I was careful to follow instructions. But the body gets older, and pushing 40, even when it was supported, I could feel my knee getting tired after long walks with the dog, or after performances. My other ankle and calf would swell (presumably from over-compensation) and I also started experiencing pain in my upper thigh/”cheek” area. Drawing Water performances are full of heart and poignant, very real moments, but they are also quite goofy and very physical– We were both highly influenced by “Lucy and Ethel”, and there’s a Carol Burnett Show like quality to our programs that use sketch comedy and musical numbers. So, naturally I wore my brace here too. Until… a show came along in the spring of 2003 requiring no real choreography and a more sedate set of scenes. 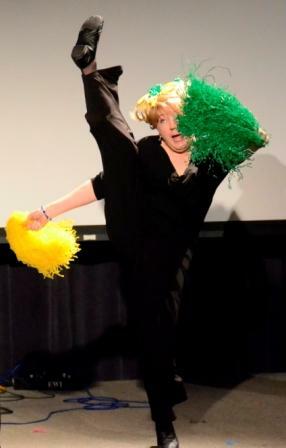 During this performance (where I decided not to bother with the brace) I literally felt my knee stick in a position, and I realized things would have to change. It was time for a check up. As it turned out, all I really needed was a new brace fitted for better support, and some physical therapy for my I.T. band which had been stressed. Before I knew it, I was good as new (well, relatively speaking) and cleared to get back on stage. 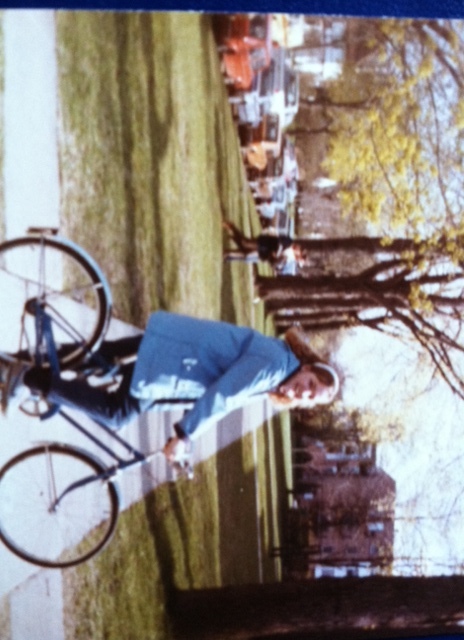 When I returned to Northwestern as a sophomore in the fall of 1983, I was a woman with a mission- to learn to walk again. What I didn’t fully realize were all of the things that would require adjustment and change. The practical things came first… Originally set for a room on the 3rd floor of my co-ed fraternity (translation old house, no elevator), I now needed something on ground level. My work study job in the cafeteria had to be switched from “server” to “checker” (sitting at a desk verifying student meal accounts), and I had to learn how to navigate on the Chicago El on crutches. I am still thankful for so many helpful people who were willing to make accommodations for me. 🙂 One answered request that I still consider a MIRACLE had to do with arrangements for my rehab. I was referred to Northwestern’s Sports Medicine/Orthopedic Surgeon and though I didn’t play for any team, I was allowed to use the Sports Rehab Facility in Dyche Stadium at peak hours and at no cost!! The referring specialist said my injuries were so bad,the physical therapists on staff could learn something from working with me! It’s kind of a blur now, but three days a week I faithfully took the El to the stadium where I was monitored by dedicated P.T. folks as I rode the stationary bike, and commisserated with injured athletes in the whirpool. Emotionally the year was hard on a different level. I was surprised by how many people were so callous as to write me off for my misfortune, or perhaps my stupidity. I also quickly learned the difference between those who offered me pity, and those who offered me sympathy. Listen up peeps: if you’re ever faced with a friend in a similar circumstance, always offer the HOPE of recovery!! I questioned what I was supposed to do, and who I was going to be… especially now that the likelihood of going into professional theatre might not be an option. Scrambling for a “backup plan”, there was an opportunity to add Speech Education and a teaching certificate to my program, and I took it. That’s when I discovered the joy of teaching! Another MIRACLE–See, I honestly may have never realized my abilities and passion in this area had it not been for my summer injury. God knew my heart, and while theatre continues to be a part of my life today, so does teaching, in a multitude of ways! !